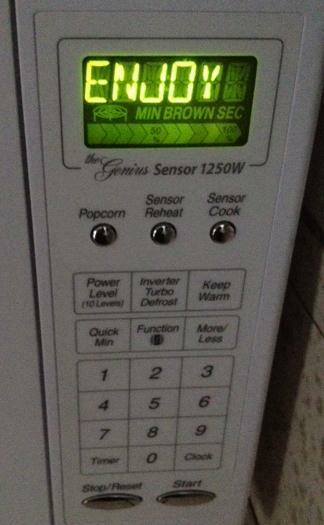 It’s quite pleasant that you display the message “Enjoy your meal” when your heating task is complete. However. Question. How do you know that I’m not heating up a heating pad or something? Do you expect me to EAT a heating pad? That’s a terrible idea. Yes, you’re right, that IS exactly what I was going to type. I know it must be frustrating that I’m ignoring you. It’s like when someone is trying to do a puzzle, and they’re moving very slowly, and you want to help, but they want to keep doing it themselves, and you keep trying to reach out to help them and pulling your hands back, as they keep doing it themselves, piece by frustratingly-slow piece, and you end up sitting on your hands, and biting your lip until it bleeds. It’s not that you’re wrong. It’s not that I don’t know how to use autocomplete. It’s just that my fingers need the exercise. It’s confusing to me that when I want to toast something, and I twist the toast knob to “Medium,” that the timer makes noise and clicks and even dings when finished — all while you’re not even plugged in, and not producing any heat at all. We have an on-again-off-again relationship, that’s the only way that “you” and “me” will work. How long have you worked here, DVD Player? Please, have a seat. Do you like your job? That long? That much? Well, I’m glad to hear that, DVD Player, but that makes the next thing I have to say much harder. You see, DVD Player, I notice you haven’t actually played any DVDs in… well, at least a year. Possibly two. Yes, I know that’s hardly your fault, and that you’re standing by ready to help. And yes it’s true that we have a lot of DVDs here. Too many, in fact. Hah! We have a good laugh every now and then together, DVD Player. But the truth is, DVD Player, technology has marched on, and you’ve stayed still. We’ve all changed a lot. But not you. And really, those unskippable previews and FBI warnings? That’s not looking good for you right now, DVD Player. No, I take your point, but I’m afraid there’s no room here for you anymore, DVD Player. I’m very sorry. Come on now. Don’t cry. It’s much harder if you cry. Please, let’s make this easier on both of us. I’ve already packed you up. The Goodwill is down the street. Your old friend the VCR is already waiting for you there. I know you’re going to be much happier being used by some family that has a use for you. Thank you for your years of service, DVD Player. I’ll miss you in the abstract. Go on now. P.S. Yes, I realize this is a somewhat unusual letter. But I wanted you to read this when I wasn’t there in person. Sorry. I expect you to be gone when I get back. This entry was posted by Stephen on Sunday, July 8th, 2012 at 7:34 pm	and is filed under technology, thoughts. You can follow any responses to this entry through the RSS 2.0 feed. You can leave a response, or trackback from your own site.